This entry was posted on Saturday, October 15th, 2011 at 23:12 and is filed under Government Reform, News, Politics, Restoration, Tea Party, Update. Dear Sir, this exclamation is sincere and not meant as a superlative alone! You are a scholar and a gentleman, and as much as one can hope to peer into your mind from merely having read (most all of) your blog I can say with complete certainty that I am committed to the idea of MarkAmerica for President! Your grasp on the fundamental workings of our great Nation, the safeguards that must be restored in order to perpetuate this most noble of experiments and to secure, for posterity our Liberty, among all other Rights is exactly the salve our Nation requires, nay demands at this moment in our history. Let me be the first, if not among he first, to offer my skills, time and resources to lead your campaign to the Whithouse. This is not some simple whim in a comment section, but a sincere offer as I believe that I have a plan to gain access to the mechanism, the people and the money necessary, even given the short amount of time before us required to make a successful first time bid for 1600 Pennsylvania Avenue in this coming election season. Please, do sincerely consider my offer and do contact me so that we may begin the dialog to make it so and to restore our Nation to the fundamental structure which intended to guarantee it's future inheritance of our noble experiment as the light of the world, the guarantor of Liberty, the cornerstone of our unalienable Rights! Ken, Thank you but I'm not qualified by the same standards I set for what a President ought to be. Besides, I haven't the charisma for a TV audience. Well said, Ken. I'm also inspired by Mark's ideas and insight into the fundamental principals of liberty and constitutional government in these articles. I'll continue to lurk here, if only to praise Mark for his hard work and determination. To add to the conversation RE: Where do we go from here, Ron Devito has an excellent piece at us4palin (http://us4palin.com/where-gov-palin-leads-we-shall-follow/) that I would highly recommend to anyone who appreciates Sarah Palin as a special kind of leader. that lead him to write this one and was going to post it here when I saw that you had already done it. Mark, as usual, you did a great job with this piece. Thank you for the time and efforts you make to inform and support us. And thank you for your insights on the Declaration. I used to teach American Literature and this was always one of my favorite things to teach. Yes, it was actually in our literature textbooks! From teaching it year and year, I grew to understand and appreciate so much more what our founding fathers established through this document. Thus, it breaks my heart during these times to see it disregarded and unappreciated! 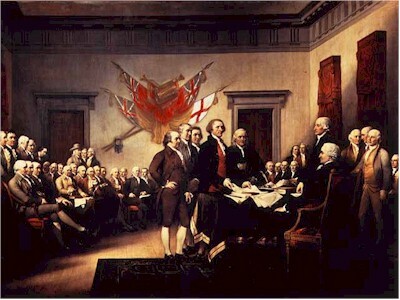 The men who drafted it and signed it were brave and brilliant. They had a clear vision for America. We can only pray that the vision of our next president will be in line with our founding documents and that he/she will respect these governing documents as they should be respected!